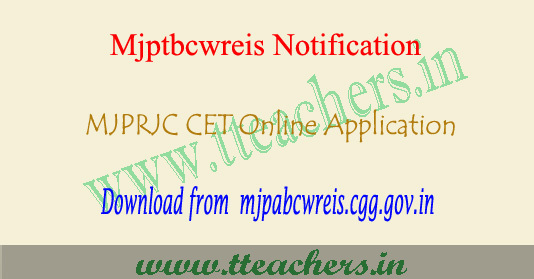 Mjptbcwreis application form 2018, MJPRJC CET apply online : MJPRJC CET application form 2018 has been released in the month of March 2018. Mahatma Jyothiba Phule Telangana Backward Classes Welfare Residential Educational Institutions Society simply it says Mjptbcwreis organize Telangana Gurukula residential Junior colleges admissions for 1st year MPC, Bi.PC, CEC, MEC etc..courses for the academic year 2018-2019.. 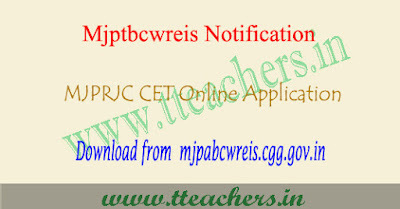 Candidates seeking admission in MJPRJC courses may apply through online.Here we have to given more information about MJPRJC CET apply online 2018 through this article. Candidates who want to apply to MJPRJC CET can fill the application form 2018 from March 2018. The application form available till April 2018 (upto 5:00 PM). Students can fill the application form through official website. Candidates can also visit the nearest internet centres for filling the online application form. 1. The students appeared for X Class Examination 2018 or its equivalent alone are eligible to appear for the Entrance Test. Advance Supplementary Candidates are not eligible for Admission. 2. 25% of Seats will be reserved for the students studied in MJPTBCW Residential Schools and BC Welfare Hostel Boarders. 75% of the seats will be allotted for other students 3. Annual Income of the Parents/Guardian shall not exceed Rs.1,50,000/- Rural areas and Rs.2,00,000/- in Urban Areas. The candidate after satisfying himself/herself about the eligibility shall pay Rs.150/- through PAYMENT GATEWAY centres from 20-02-2018 to 05-04-2018 to enable to submit application online.